The Hornet beats the bandit but 2 two things struck me. 1 is I think the Bandit would have the hornet on any Irish (twisty) road and 2 haven’t they great straights on their roads where they are, with a decent surface too. Feckers. 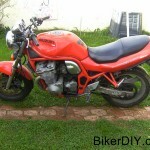 My Bandit 600n factory specifications. Saving the Bandits paint work, compounding and polishing. 1996 Bandit: The bike and the back story.